An outpatient pharmacy that provides medications to the residents of Richland County and surrounding areas. Medications and consulting services are also provided to Sidney Health Care Extended Care Facility residents. 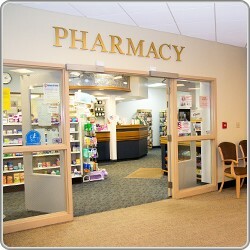 Clinic Pharmacy provides medication therapy management as well as mail-out and delivery services. Clinic Pharmacy is located at Sidney Health Center. Please Note: Specialty items can be ordered upon request. Provides medication therapy to inpatients and outpatients who receive care within the facility.